St. Mary's Parish Choir under the direction of Steven J. Hansen was founded in 1990. The choir began with 11 singers and has grown to almost 50 members. In 1996 the choir went to Rome, Italy and sang for a Sunday Mass at St. Peter’s Basilica and for His Holiness Pope John Paul II at the weekly Papal Audience. You will have fun singing and serving the parish as a member of the choir. Enjoy new friends, choir parties and Sunday breakfasts. The Parish Choir sings weekly at the 10 AM Sunday Liturgy from October through May. The choir also sings for Confirmation, the Mass for the Deceased Members of the Parish, Christmas Midnight Mass, Ash Wednesday, Holy Thursday, the Easter Vigil and Easter Sunday morning and the Mass for the Anointing of the Sick. There are no auditions and the only requirement is that you enjoy singing . Rehearsals are on Wednesday evenings from 7:00 – 8:30 pm in the Music Room, room #3. The choir is open to High School Students and Adults. Would you like to be a part-time choir member? Join us from September thru December or from January thru May. Singing in the fall includes the Christmas Season. Singing in the winter includes Easter. We have a few “snowbirds” in our choir and especially need extra people in the winter to replace them. Have questions? Please call Mr. Hansen at (734) 730-7970 or email him. ​GraceSong is a small contemporary music ensemble that includes adults of moderate musical ability. We provide music for the third noon mass of each month, and strive to provide the opportunity for the congregation to participate in the mass through music. “Chords of Christ” is a young adult Contemporary Christian music group ages 18-35 that strives to praise the Lord with music, by leading the congregation in song at masses, providing music at various St. Mary parish events, and experiencing Christian fellowship as a group. Our group meets the 1st and 3rd Tuesday of the month at St Mary our Lady of the Snows Church located at 1955 E Commerce, Milford Mich. from 7:15pm - 9:00 pm. 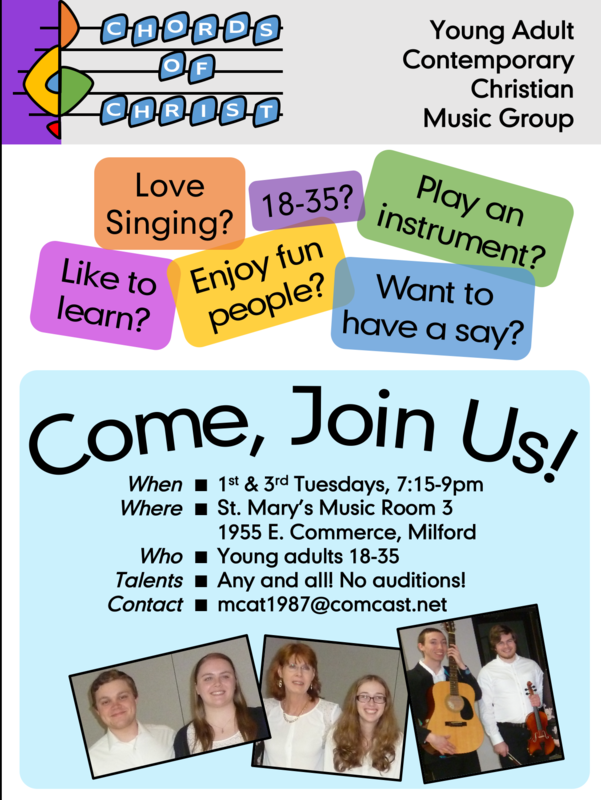 We always welcome new members to join our group and share your musical talents with us. Download our flyer and share or view our concert on you tube. New Covenant Youth Ensemble was established in 1999 and is comprised of 6th thru 12th graders from St. Mary Parish. This non-audition, volunteer chorus is continuing to add new members to our dynamic and exciting group. We welcome singers, and musicians that play any musical instrument. Our Ensemble, as a part of the Music Ministry at St. Mary, leads the celebration of Mass on the second Sunday of the month at noon. We also perform at various other times throughout the year and at other events. In the past, our group has performed at the YMCA in Milford and gone Christmas caroling at Senior centers. If you love God and love music then please join us. In addition, participation in this Music Ministry is accepted as service hours for Confirmation and National Honor Society. Don’t miss out on the excitement, come be a part of our group to sing, share your talents, and meet many new friends. Stop by our rehearsals any Sunday to see and hear what we do! When are Rehearsals? The Ensemble meets most Sundays from 11:00 AM-12:00 in the music room. For downloadable PDF Schedule & Registration Form click here.